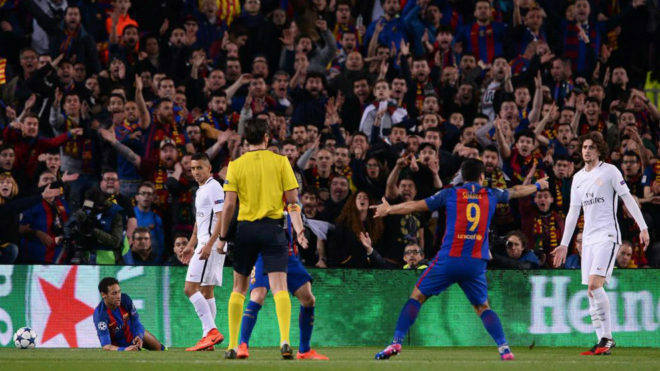 Amid the controversial Champions League comeback by Barcelona over Paris Saint-Germain at the Camp Nou, a petition has been launched to make the two teams replay the match. Far from dying down, Deniz Aytekin’s performance keeps on receiving more critics. Thus, a fan named Luis Melendo has expressed his desire for the duel to be replayed by initiating a petition on Change.org, the world’s largest platform to mobilize support. Almost 3000 people have signed the petition, which lists 13 questionable calls by Aytekin. – Minute 11: Uncalled penalty on Javier Mascherano after using his hands inside the box. – Minute 23: Red card not given to Pique. – Minute 42: What should have been a second yellow for Gerard Pique turned into Edinson Cavani being booked. – Minute 45: Three and a half minutes of added time. – Minute 48: Non-existent penalty on Neymar, who deliberately seeks contact. – Minute 54: Neymar simulates a penalty again. A card was not issued. – Minute 64: Act of aggression by Neymar, who deserved to be sent off. – Minute 78: Hand-ball by Pique inside the box. Not called. – Minute 85: Uncalled penalty on Mascherano for taking down Angel Di Maria inside the box. – Minute 89: Blatant dive by Suarez that somehow earned a penalty. – Minute 92: Suarez deserved to be shown a second yellow card for simulating a penalty.